How to Prevent Innovation in Your Company. And the best thing about it: You can download it FOR FREE!!! The only thing I ask for is, if you download the book, please leave a short message in the comment section of this blog entry. You might tell me who you are, why you download the book and how you like this offer, for instance. This way I get a little feedback. Or maybe you want to tell me your most stunning encounter with uninnovativeness. Thanks in advance! I published the German edition of my book in September 2009 as a print-on-demand book. So far it has made quite good progress, and I got a lot of valuable new business contacts for my work as a management consultant. Of course it is no "Harry Potter", but for a business book it is doing quite well and I am content with it. After a while the idea of an English idea came to my mind and grew and grew. So at one point at the end of 2010 I sat down at my desk and started to translate the book. Since I did the translation entirely myself without the help of a native speaker of English, there might be some mistakes or expressions which are more Genglish (German + English) than English in it. In fact, I expect that there a quite a few. So if you find any of them, I would appreciate it, if you could let me know. I will collect them and after a while incorporate them into a second revised edition. I decided to publish the book FOR FREE to maximize its circulation. So please feel free to download it, print it for private use and share the link of the book with as many people as you like. 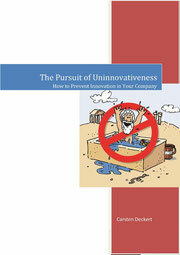 Here is the link to The Pursuit of Uninnovativeness. I sincerely hope that you enjoy reading it and look forward to your comments. Ihrem auf Xing hinterlegten Link folgend bin ich dabei, die englische Version ihres Buches auf meinem Computer zu speichern. Ihrer Bitte folgend möchte ich einige wenige Worte über meine Person niederschreiben. Ich heiße Heiko Seeger, bin promovierter Physiker und nach einigen Jahren in der Wissenschaft, bin ich seit einigen Jahren als freier und nun seit April fester Mitarbeiter eines kleinen italienischen Beratungsunternehmens (CRIT Research). Dort arbeite ich als Technologie- und Innovationsberater. Vielen Dank für den Gratis-Download. Ich bin Innovationsmanager und für mich manifestiert sich Uninnovativsein am prägnantesten durch Sätze wie: "Das haben wir doch noch nie so gemacht! ", "Das machen wir jetzt seit 20 Jahren so! ", "Worauf verschreibe ich die Stunden?" vielen Dank für den Download Ihres Buches. Zu meiner Person; Ich stehe als Marketing-Student nun vor der Aufgabe meine Abschlussrabeit zu verfassen. Da ich diese, wie könnte es momentan anders sein, über die Social Media, im Kontext von Markekommunikation, schreibe, ist der Free Download Ihres Buches sowohl ein erstklassiges Praxisbeispiel, als auch eine Bereicherung für meine Arbeit, die sich in Teilen auch mit Change Manangement befasst.